October is here and soon parents and children’s minds will be turning to costumes, games and trick or treating. Halloween should be a little bit scary and a lot of fun! Ghoulish costumes, ghost and witches, trick or treating and scary sounds. But for parents of kids with food allergies scary can take on a different meaning when it comes to trick or treating. The reality is many of the treats handed out at Halloween may contain common food allergens such as nuts, peanuts, dairy, egg and soya. 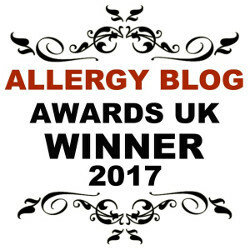 Allergic reactions can vary from mild rash and itching, to stomach cramps and vomiting, to Anaphylaxis which is a severe potentially life threatening allergic reaction. So even if your child doesn’t have allergies, maybe a family member or neighbours child does and it’s good to have a few alternatives to hand to avoid sad faces. Go with your child to designated houses (friends and family) where you have already explained your child’s allergies and have a pre-approved stash of allergy free goodies. Agree that nothing will be eaten until all treats are checked, any that contain the allergen can be swopped for something suitable. Remember that the ingredients of ‘fun size’ sweets may differ from the regular-size bars. Sometimes allergy information may not be displayed when the sweets come from a bigger pack, so if in doubt throw it out and replace with something safe. Throw a Halloween party, turn your home into a haunted house and invite friends to come to you. Create your own play list such as ‘Monster Mash’ ‘I put a Spell on You’, ‘Ding Song the Witch is Dead’ ‘Thriller’ and ‘Ghost Busters’. Hide allergy safe treats around the house and garden and have a scavenger hunt. Focus your child’s attention on the costumes and party games and less on treats. If you are going to include face painting in your costume, don’t forget to check ingredients for allergens. Allergy Lifestyle has a limited number of Allergy friendly Halloween face paint packs free from Peanuts, Dairy, Eggs, Shellfish, Fish, Soy, Wheat, Corn, Parabens, Tree Nuts, Beeswax, Coconut, Phthalates, Sesame, Shea Butter, Sunflower, Peas, Animal Products, Petroleum. Fully charged mobile phone in case of emergency. Consider allergy wristbands or medical jewellery to raise awareness. Check with your school or childcare in advance to see if they are planning any Halloween activities and check they are safe for your child. Allergic children do not want to be treated differently from their peers. As parents we want to keep our kids safe but also let them have fun and enjoy Halloween with their friends, with a little planning and preparation there is no reason your child needs to miss out on Halloween fun. Preparation is the name of the game for a fun filled night for all. Adrenaline pen holder or Medicine Carry Bag: Consider an Adrenaline pen holder or Medicine Carry Bag so you can have your antihistamine, adrenaline and fully charged mobile on you in case of emergency. Allergy Alert Wristband or Medical Alert Jewellery: Consider an Allergy Wristband or Medical Jewellery with allergy information and emergency contact numbers. How long does anaphylaxis last? How does anaphylaxis happen so fast?